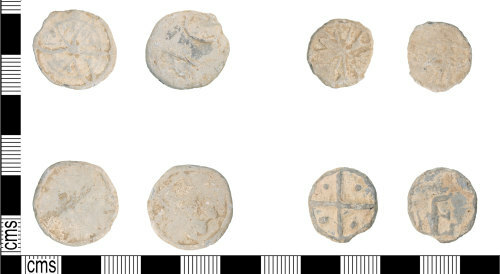 A group of four late Medieval to post Medieval (AD.1400-1700) cast lead tokens, found in the same location. A - The token is cream coloured and very worn, it has an inner ring and intersecting petal design on one face. The other face may have had a design now too worn. Diameter: 22.09mm, thickness: 2.23mm, weight: 6.49g. B - The token is cream coloured and very worn, it has a radiating spoke design on one face. The other face may have had a design, now too worn. Diameter: 17.71mm, thickness: 2.4mm, weight: 4.32g. C - The token cream coloured and very worn, there appears to have been a design on at least one of the faces, this is now too badly worn. Diameter: 22.65mm, thickness: 2.07mm, weight: 6.47g. D - The token is grey and cream in colour, with a design on both faces. One face is quartered by crossed raised lines; there is a raised pellet in each quarter. The other face has an embossed capital E.
Diameter: 18.65mm, thickness: 2.60mm, weight: 5.07g. Similar tokens to Token D are illustrated by Fletcher (2003, 40) who suggests most of the tokens such as this, are imitating a medieval coin, however, simply date to the 15th or 16th centuries; tho these are unifaced and token D is bi-faced.